Screen capture of a YouTube video capturing Canadian singer Michael Buble giving an impromptu performance on the New York City subway station below the Lincoln Center. Michael Buble subway:Canadian singer Michael Buble gave an impromptu performance on the New York City subway station below the Lincoln Center. Buble dressed in a black suit and sang as passersby snapped photos of him and his singing group. The 37-year-old singer posted the video on his YouTube page. 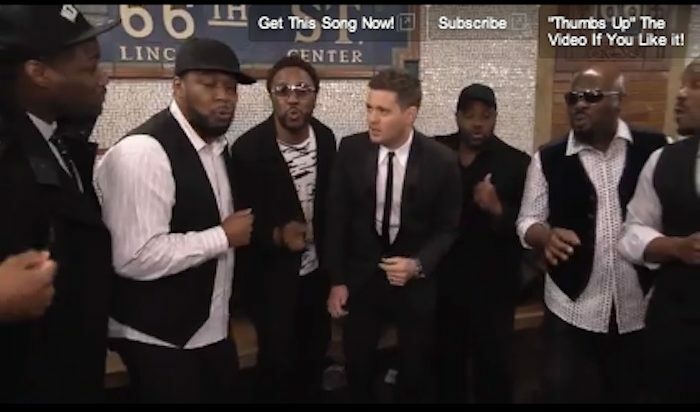 “Michael Bublé took to the NYC Subway stop at W. 67th Street today for an impromptu acapella performance of ‘Who’s Lovin’ You’ -off his new album ‘To Be Loved’ – with the group Naturally 7!” reads a description on his page.